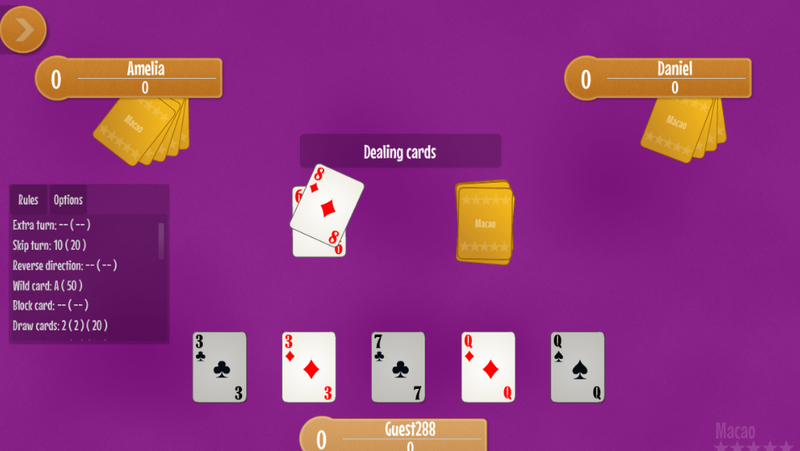 Hearts is trick-taking free game usually played by 4 players.Hearts has similar rules to Whist, Bridge and Spades trick takinggames, but the game is unique among these games because you need toavoid taking penalty cards (like any hearts and the queen ofspades).❤ Hearts game features: ❤ ✔ Play online in multiplayer modeor with AI in single player mode ✔ Login with Facebook or Google ✔Access Google Play Games achievements and leaderboards ✔ Changebackground color ✔ Change gameplay settings (number of players,difficulty, speed, some game variations like Queens, Shooting themoon, Breaking hearts, etc) ✔ Statistics (games played, games won,and more) ✔ Chat (when playing in multiplayer mode)This Hearts gamecan be played by 3 or 4 players in single player and multiplayermode with friends and family.When the game is played in 3 players,the 2 of diamonds is removed from deck and each player receives 17cards.When the game is played in 4 players, each player receives 13cards. ❤ Cards passing: ❤Before each hand begins, players canchange cards that they do not want between them. Number of cardsthey can change can be changed to 3, 2, 1 or 0 to disable thisrule. In first round, your cards will go to player on your left,second round, your cards will go to player on the right, thirdround, across (if there are 4 players). ❤ Gameplay: ❤Hearts game isplayed like the most of the other trick taking game. Players mustfollow suit if possible, if not, they can play any card. The firsttrick is lead by the player who holds the 2 of clubs. ❤ Penaltycards: ❤Queen - 13 penalty pointsAny card of hearts - 1 point ❤Goal of this card game: ❤Goal of the game is to avoid takingpenalty cards.The winning player is the one with the fewest penaltypoints.When you discard all of your cards, the round is over, butnot the game. The game ends when a player reaches the targetpoints, you set before game, and the winner is the one with thefewest points. ❤ Other Hearts variations and options: ❤You canchange: - number of points needed in order to end a game - numberof players 3/4 - number of cards to pass before each hand -difficulty normal/hard - Shooting the moon variation - if you takeall the penalty points, your have to options: - New moon - playersubstracts number of all penalty points (usually 26) from his score- Old moon - player's score remains unchanged and the other playersadds to their score the number of all penalty points - Queensvariation - all queens are penalty cards and they have 13 penaltypoints - Breaking hearts variation - Hearts can not be lead in thefirst trick unless someone "broke" them before. When a playerdiscard a heart on the lead of another suit it's called "Breakingthe hearts".If you love card games from Whist's family, this is amust play for you.Please send us suggestions and ideas. We want toimprove this game. There is also an in-game function to send usyour feedback. "21 Blackjack City" is free and you will never need to wait forchips if you run out. You will always have chips in yourbalance. "21 Blackjack City" features:✔ Truly random shuffling✔ Canbe played offline✔ Achievements and Leaderboards✔ Blackjack withside bets (Perfect Pairs Blackjack, Royal Match Blackjack, etc)✔Random BONUS while playing (you can double your bonus over and overagain)✔ Balance always higher than 500 points.Enjoy!